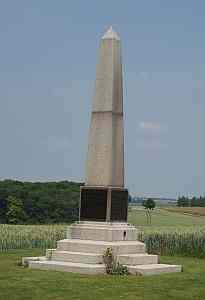 The memorial was unveiled by General Sir Ivor Maxse , KCB , CVO , DSO on 2 August 1925 on the site of fierce fighting at Thiepval in the Somme. General Maxse was regarded as the father of the Division. A service of dedication was led by Rev W H Baddeley DSO , MC who was an infantry officer during World War One. 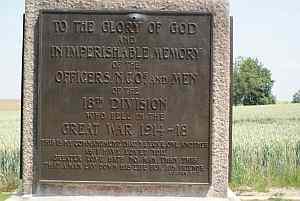 The 10th Essex were members of the 18th Division throughout the war. 50 men from the 10th Essex travelled from Victoria Station to Albert (a town that they freed during the war) where they billeted for the night. On 2 August 1915 the men formed up with the war time battalion flag flying and medals worn to march via Aveluy and Authuille to Thiepval where they formed the guard of honour around the memorial.